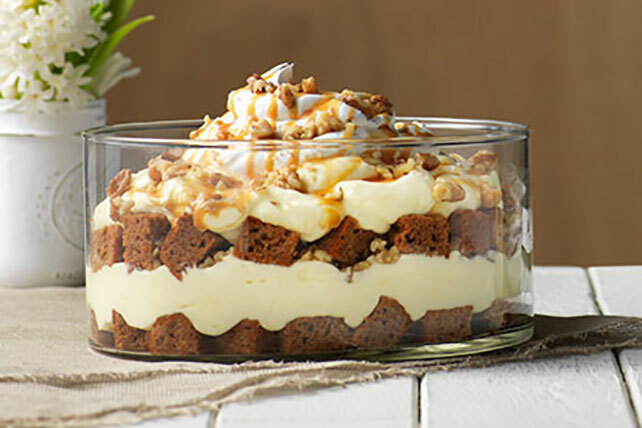 Take carrot cake to the next level with our Carrot Cake Trifle. You'll be pleasantly surprised at how easy it is to make this sweet Carrot Cake Trifle. Loosen cake from sides of pan with knife. Gently remove cake from pan; place on cutting board. Cut cake crosswise in half. Cut one half into 3/4-inch cubes. Wrap remaining half tightly; reserve for another use. Beat cream cheese in large bowl with mixer until creamy. Gradually beat in 3 cups milk. Add dry pudding mixes; beat 2 min. Gently stir in 2 cups COOL WHIP. Layer half each of the cake cubes, pudding mixture and nuts in 2-1/2-qt. serving bowl; top with layers of remaining cake cubes, pudding mixture and COOL WHIP. Refrigerate 2 hours. About 20 min. before serving dessert, microwave caramels and remaining milk in microwaveable bowl on HIGH 2 min. or until caramels are completely melted and sauce is well blended, stirring after each minute. Let stand 15 min. Drizzle caramel sauce over dessert just before serving; sprinkle with remaining nuts. Save 60 calories and 3g of fat, including 3g of sat fat, per serving by preparing with PHILADELPHIA Neufchatel Cheese, fat-free milk, 2 pkg. (1 oz. each) JELL-O Vanilla Flavor Sugar Free Fat Free Instant Pudding, and COOL WHIP LITE Whipped Topping. This delicious trifle can be refrigerated up to 24 hours before serving. As directed in recipe, prepare the caramel sauce and drizzle over trifle just before serving; sprinkle with remaining nuts. Pack serving-size pieces of the leftover cake to enjoy as part of your on-the-go lunch. Or, freeze until ready to use to prepare this delicious trifle again.